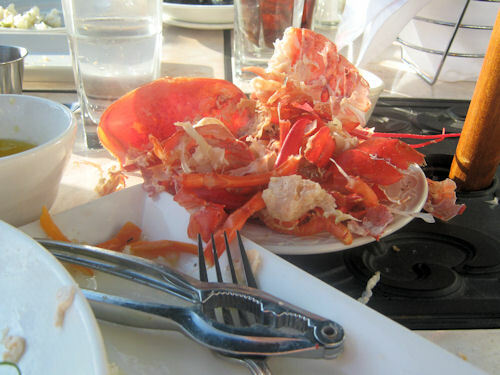 While we were in the Boundary Water, Emma had a much different experience – in and around Boston. She was a youth leader on a church trip to Boston, to the roots of the Unitarian Universalists and founding fathers (many of them both!). 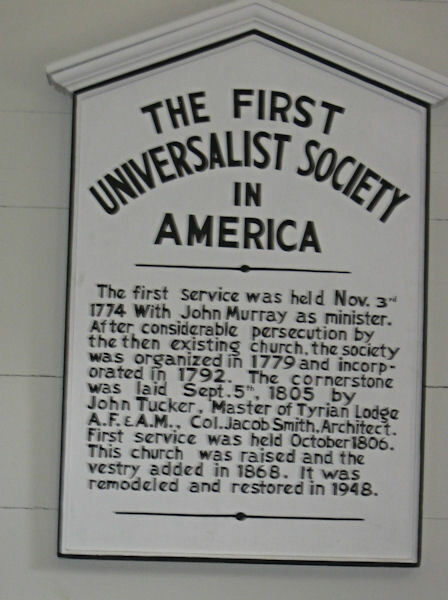 This is the first Universalist church in the US, in Gloucester. They visited some historical sites important to the beginnings of the church in the US. 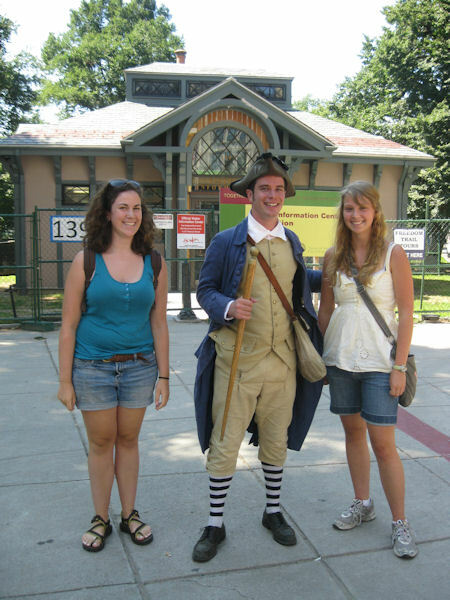 They also took in other historical sites, like the with this guide on the Freedom Trail – evidently, if he had to choose, he would choose Emma! 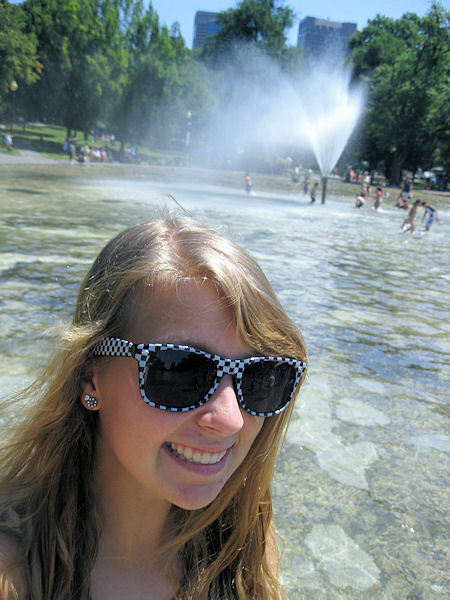 They lounged in the fountains at Frog Pond in Boston Common, bordered by Beacon Street, and next to UU headquarters. They enjoyed a high-speed, choppy ocean whale-watching (and barf watch as well). A visit and swim in Walden Pond was also on the agenda. 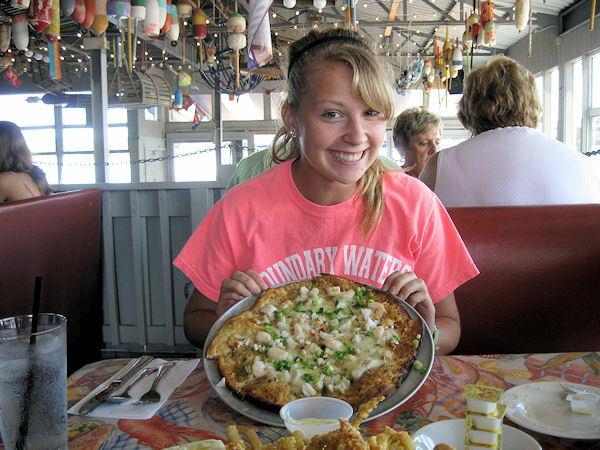 Finally, who could turn down this wonderful seafood pizza in Boston? 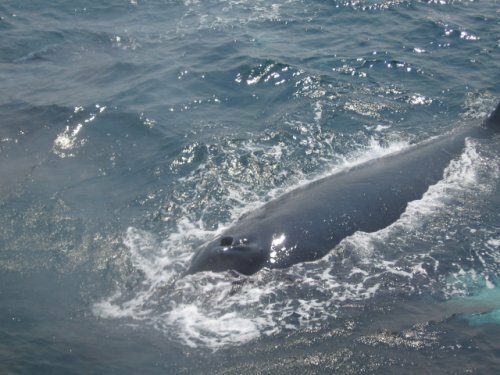 I had the opportunity to go to the marine sanctuary outside of Boston to look for whales. We were fortunate enough to see around 6 whales. A boat that was the exact same kind as the one we took. 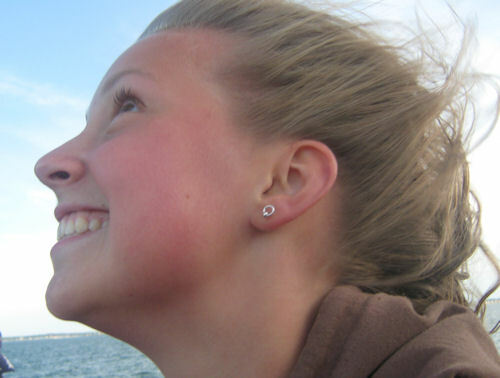 The boat ride was very windy and I let down my hair and enjoyed the wind in my hair and the salt spray on my face. 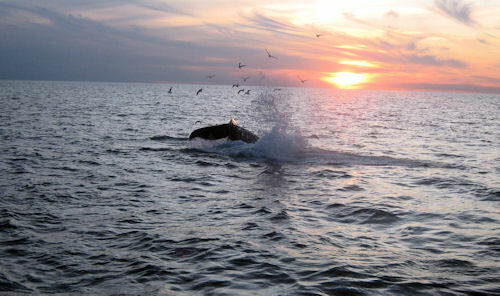 We were lucky enough to see several whales feeding. The birds surround them and pick off fish that rise to the surface. 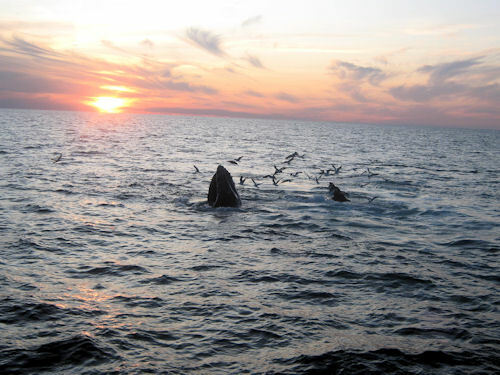 The whales swim under the surface around the ocean and scare the fish to the top and get them there. 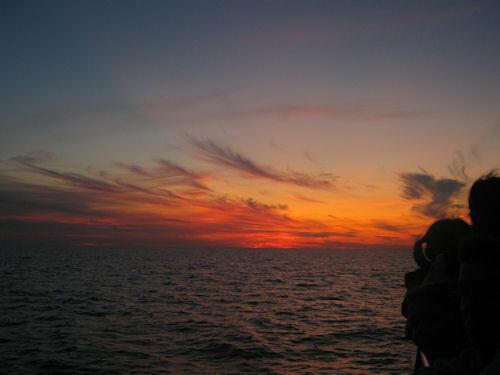 We had a truly beautiful sunset while on the boat ride. A humpback whale was kind enough to pose for this shot. We were farther out enough not to see the city in the sunset. A parting shot from the boat. We also went to Walden Pond. 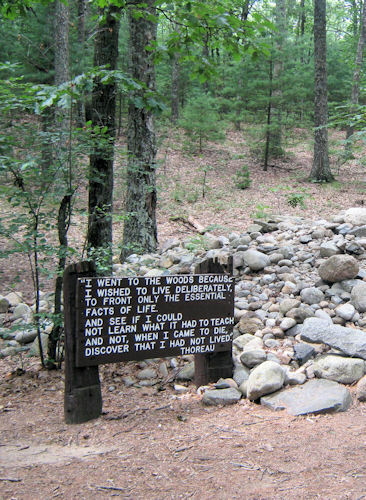 It was where Henry David Thoreau chose to live for two years of his life. He chose to live out of society to see what it was like. Where his cabin used to be. All that’s left is a pile of stones. A view from the hiking trail from the beach to the cabin. A very worthwhile walk. 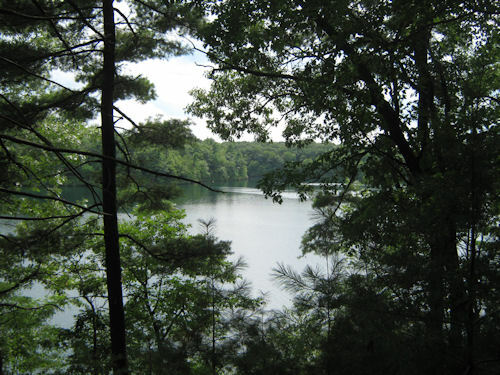 It reminded me a lot of the boundary waters in northern Minnesota because of the lake and the types of trees around it. 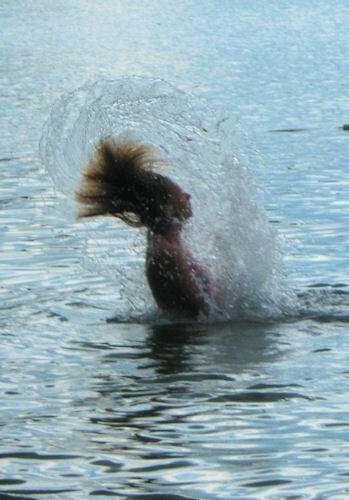 And of course, you have to go swimming. The water was some of the clearest water I have ever seen. My coming of age youthÂ group of 27 youth went to Boston recently. 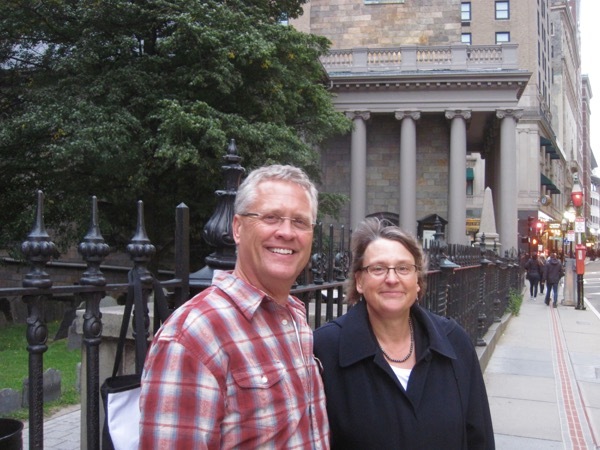 We spent a week around the Boston area learning about Unitarian Universalist history and touring around. It was definitely in the top three best trips I’ve been on. 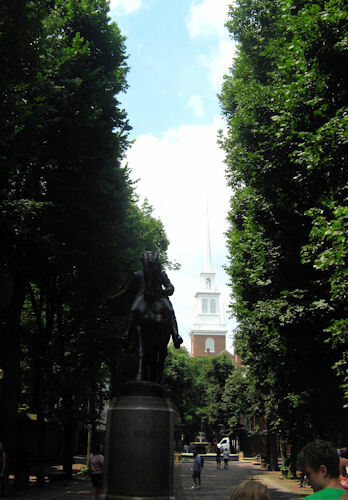 Paul Revere and Old North church. 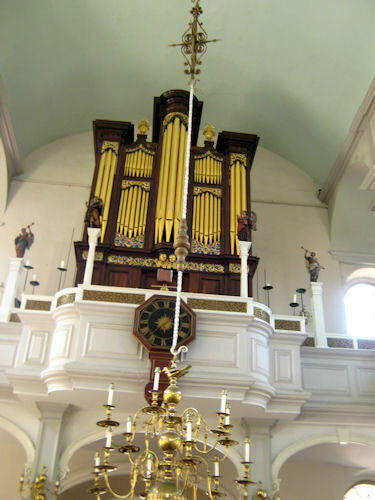 The oldest organ in Boston, inside Old North Church. 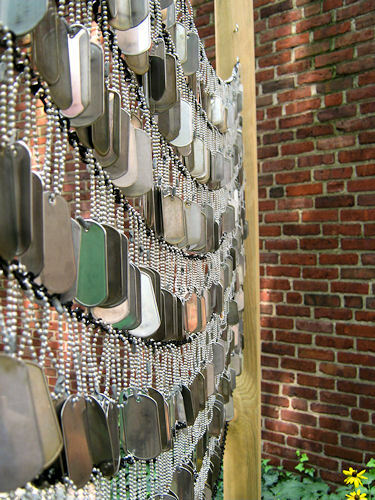 These represent fallen soldiers in the war memorial garden. We toured the house where Little Women was written. I never knew how many famousÂ people the Alcottt’s knew. 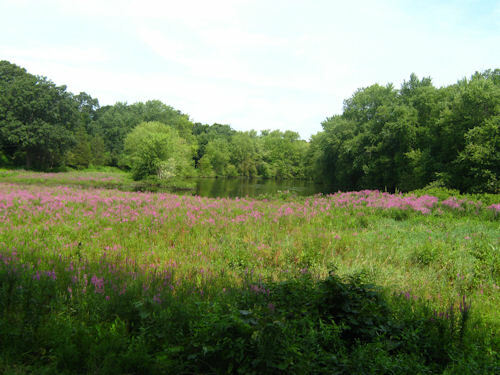 The now beautiful site of the very first battle of the revolutionary war. 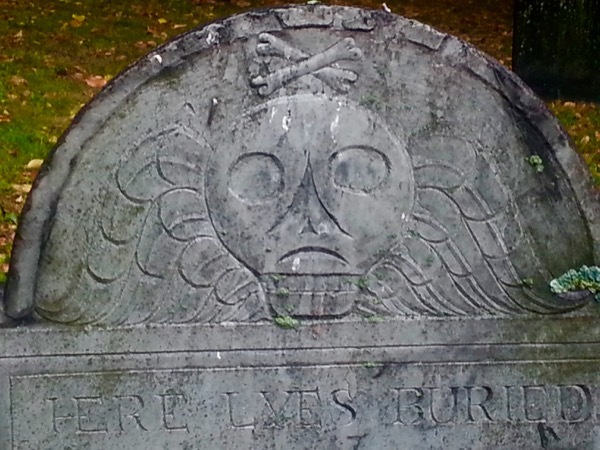 We spent an afternoon on the Freedom Trail in Boston seeing historical grave yards, churches, and Paul Revere’s house. 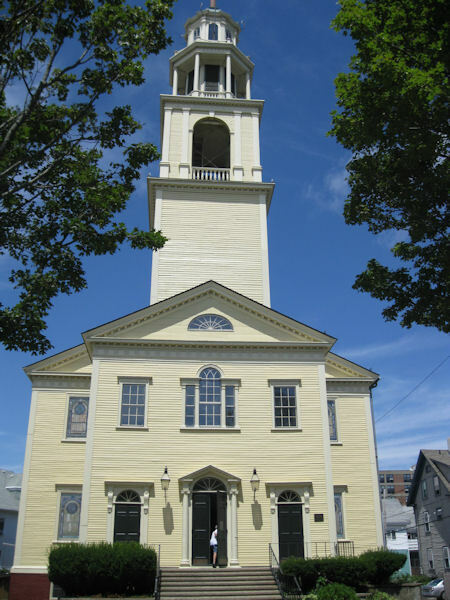 Among the most famous churches we saw included the Old North Church and King’s Chapel. 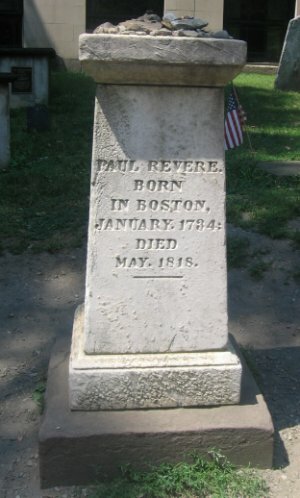 This is Paul Revere’s grave. We saw a bell that had a sign next to it that said that the bell was warranted for 12 months. It’s still working! 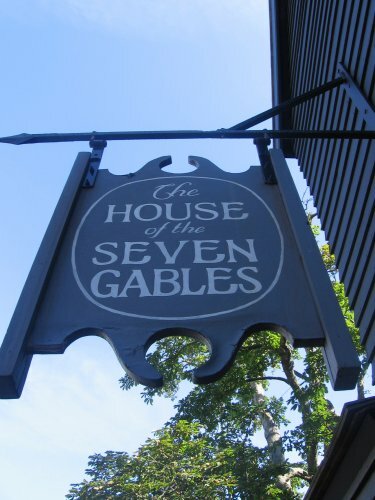 We also saw the House of Seven Gables about which Nathaniel Hawthorn’s popular book was written. We spent a large portion of time in Salem. 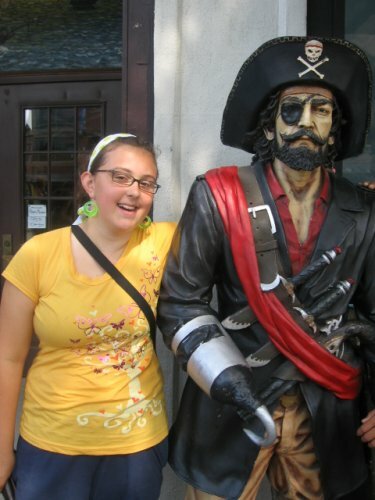 This is me with a new buddy of mine at the Pirate Museum. It is a bit of a tradition for our group to pilgrimage to Ben and Jerry’s every night (and sometimes morning) for ice cream. 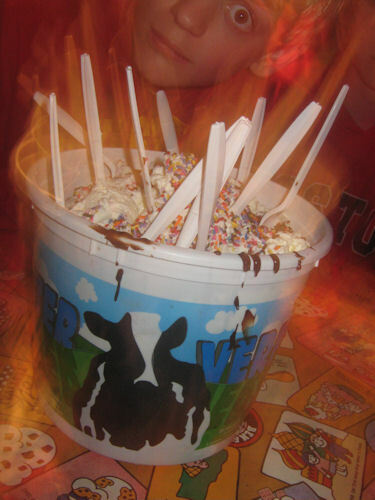 The last night, we divided into two teams to conquer the Vermonster- a delicious 20 scoops of ice cream with tons of toppings, bananas, whipped cream, and sprinkles. Above pictured is my team, before we conquered the mighty beast. 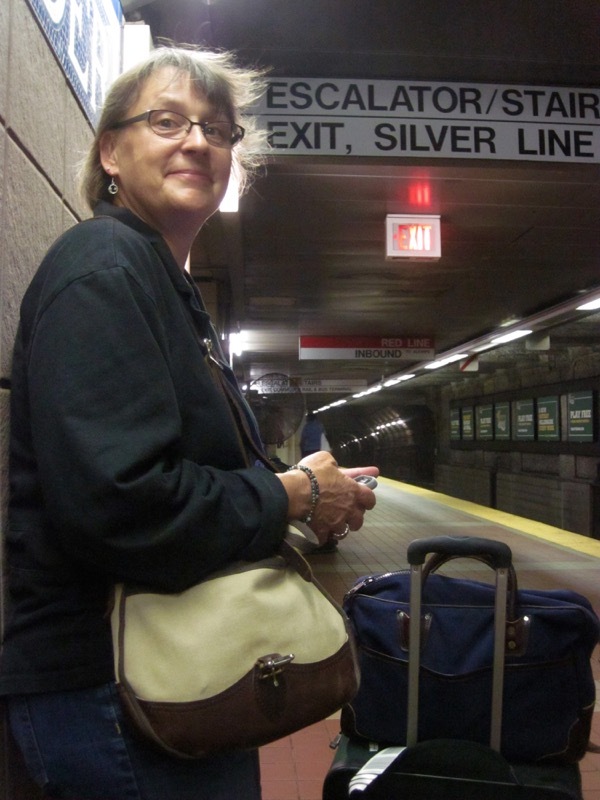 Claire is our guest blogger the next two days – reporting on her church trip to Boston. I just returned from my second trip to Boston. This time I went on the trip as a touch group leader, which gave me some responsibility. It was a group of 20 from our church. 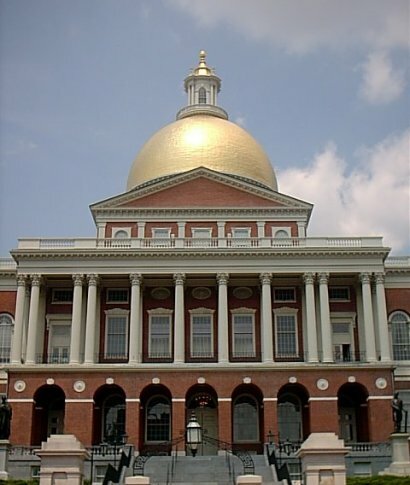 We explored many places in Boston, Salem and Concord, including Walden Pond, the Freedom Trail, Louisa May Alcott’s house, and the locations of some of the witch trials and punishments in Salem. The first part I’m going to talk about is our experiences on and in the water. Here are the girls in the group getting buried in the sand. Get buried was a common occurrence in our experience here at the beach. 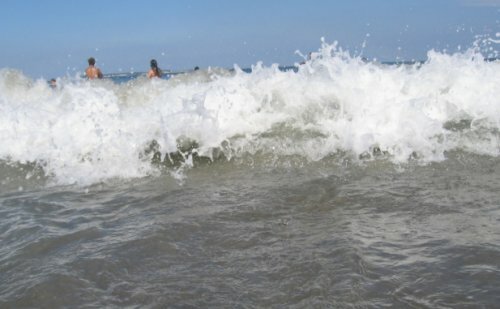 The water was nice and refreshing, especially since the first few days were in the high 90’s. We also journeyed to Walden pond and saw Thoreauâ’s cabin site. We then spent a portion of time swimming in the perfectly clear water. We spent an enjoyable morning whale watching. We were lucky enough to see 5 whales total. There was a mother calf pair who came up right to the edge of the boat and looked at us. It was an amazing experience (except for the people who got seasick and spent the time in the bathroom). 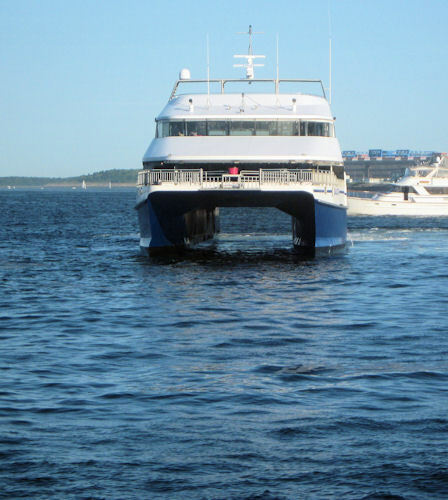 The whale watching boat was 3 decks high, with indoor cabins and then decks out in the fresh air. It was also equipped with a knowledgeable naturalist who told us everything we could possibly want to know about humpback whales. Claire is guest blogging again for part two. 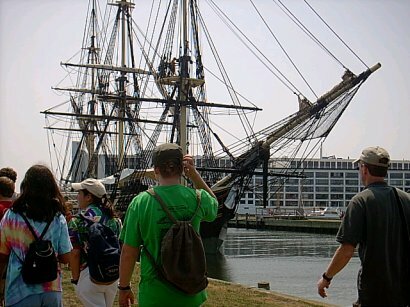 When we were in Salem, we went on a working replica of a ship called Friendship of Salem. It was captured in the War of 1812. Five of us went on the ship and toured it. It had a deck with all the working ropes, and a place underneath that had sleeping quarters, storage, and tools for navigation. It was very interesting. 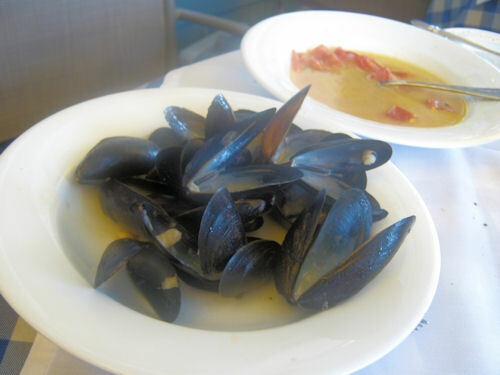 After that we went wading in the Atlantic Ocean (there were no waves due to the fact that it was a harbor). The next day we went to Glouchester. We saw the first Universalist Church that was built as a Universalist Church. 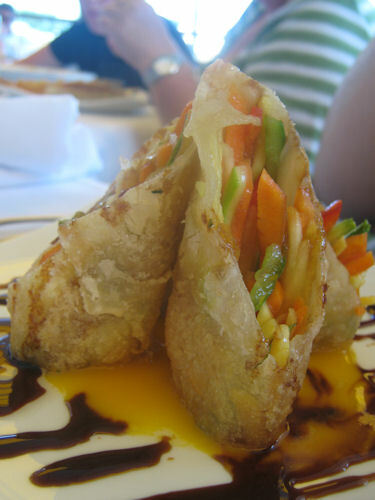 We walked around the streets and then went to lunch. Our group ate at a little cafe. We met up as a group and rode the bus to the beach. We had fun swimming, making sand castles, body surfing, and burying each other. 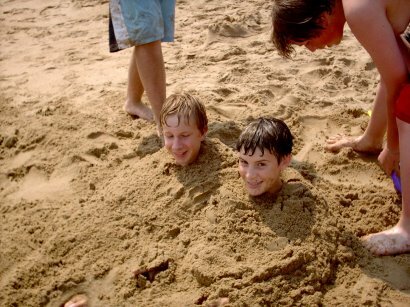 These are a few of the middleschoolers, Thomas and Alex, being buried. I was buried but for obvious reasons I could not take a picture of myself as I was completely buried. That night we had a talent show back at the Salem church. There was music, jokes, magic tricks, skits, art, poetry, and stage combat. It was a lot of fun. The next morning we packed up and went to Walden’s Pond. This is where my camera’s memory card got full so the only picture I have is of the parking lot. I was surprised to find out that you could actually swim in this beautiful place. It was a lot bigger than I imagined. I thought it would be marshy, small, muddy, and unpleasant to swim in. Basically I thought of your typical Iowa farm pond. Anyway, it was the most clean water I have ever swam in. It was clear, clean, and fresh. 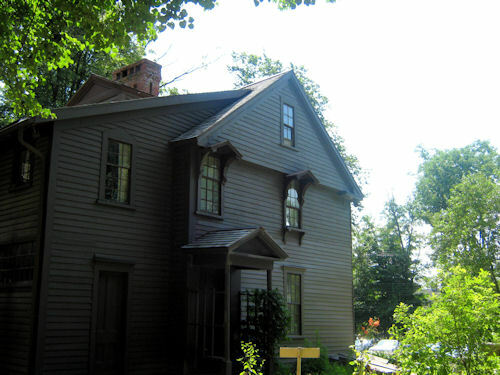 After that we journeyed to Concord to dine and then walked to Louisa May Alcott’s house. It was beautiful and most of the stuff was original. We left Concord and returned to the E&P house. Sunday was our final day in Boston. In the morning, we attended Arlington Street Church. It was a very nice service, and they had good snacks afterward. Banana cake with whipped cream 🙂 We changed and took the Subway to Harvard Square, where we again divided into groups. I ended up in a group with four boys (in case you were wondering their names were Sarek, Dylan, Rory, and Alex). We ate at a really nice pizza/Italian place. Later, we found one of those photo booth things and somehow we all fit in the tiny contraption. Unfortunately, the machine was talking in some foreign language none of us could understand, so I, the one in the front, starting pushing random buttons and eventually it spit out a picture. It was the one where Sarek was hitting Rory on the head with a pop bottle, Dylan was taking up half of the picture, and I was sitting in the front looking squished. Perfect. It was really us. On the way home on the bus, we had fun watching five movies a day, playing with duct tape, socializing loudly, and rearranging ourselves in new seats. We got caught in traffic south of Chicago and went fifteen miles in an hour and a half. It turned out that the air conditioning on the bus only worked when it was moving fast, so we were frying. We arrived home late on the ninth, about ten. It was a great trip, one of the best so far. Claire is guest blogging today. I just returned from a trip to Boston, Salem, and other places in that area of Massachusetts with this year and last year’s Coming of Age groups. We rode a charter bus, and left early August first. We drove for twelve hours and made it to the eastern border of Ohio. We stayed at a church there, and drove for another twelve hours the next day to Boston. On the bus, we mainly watched movies (about four a day), slept, and talked. 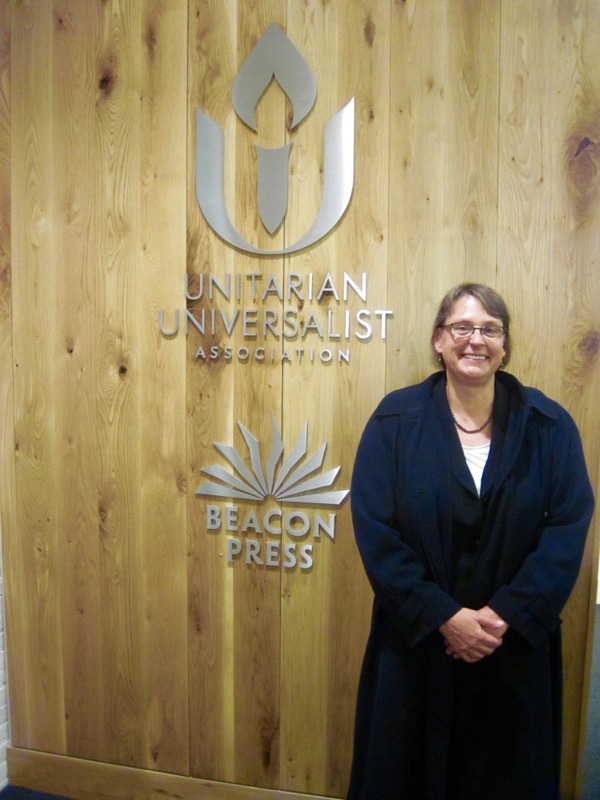 The first day we spent in Boston, we went to the Unitarian Universalist Association Headquarters and toured it. 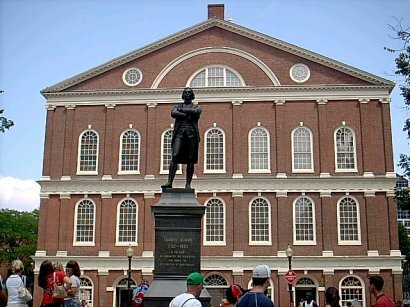 We walked the Freedom Trail and saw King’s Chapel, Old North Church, Paul Revere’s house, and other significant historical sites including the Massachusetts state capital. 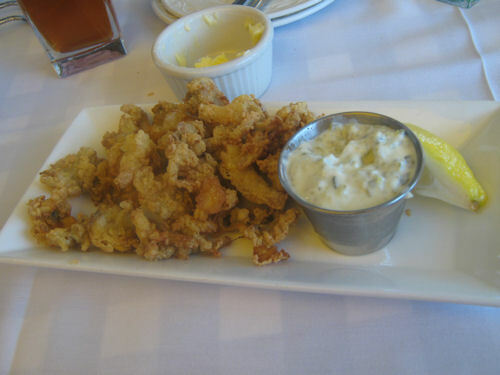 After we walked the Freedom Trail, we returned to the Quincy Street Market, where we divided into groups for shopping and eating dinner. 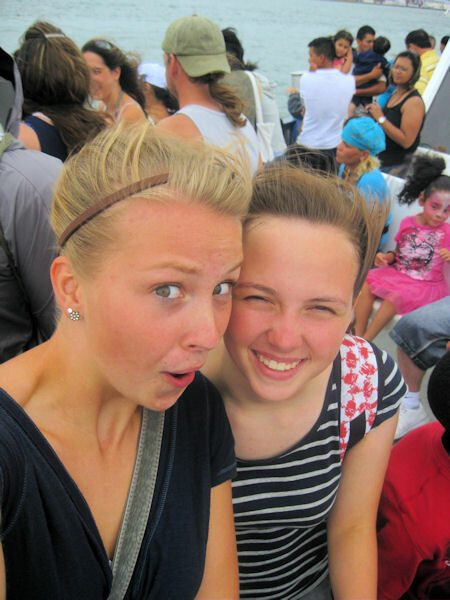 We watched street performers, magicians and acrobats, and went to a wide variety of shops. Even though it was a shopping area, like most of Boston it had a few historical statues and such thrown in. The next day we journeyed to Salem, where we spent three nights in the Universalist church. We went to the witch dungeon museum, pirate museum, a ghost tour of Salem, and the harbor, where we toured a ship and waded in the Atlantic. On this trip, I think our group became really tight, and the relationship was very much like that of a large family with twenty-two kids. It was like we were all siblings. The rest of the trip will be continued in another addition of this fine blog (good job with it dad!). Now can I have my own?